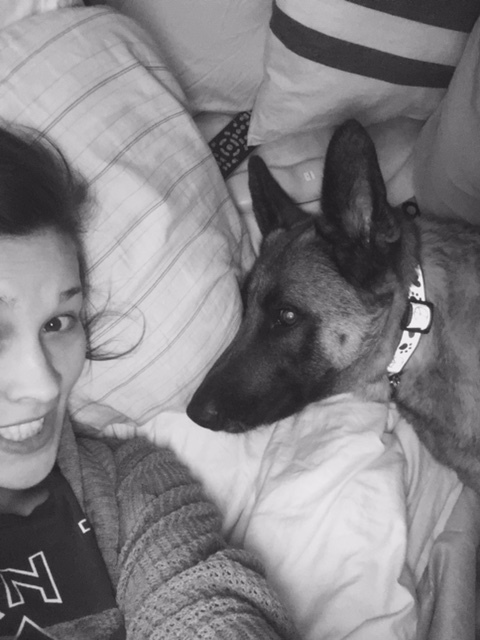 Texan Girl Talks: Shady people and like I need another reason to LOVE my dog. Shady people and like I need another reason to LOVE my dog. Yes, you read that right. I am a cat lady at heart, truly. However, having our dog has been one of the best parts of my current days. My Greta girl is so loving and is very attached to us already. She puts up with our cats and really has been a wonderful addition. Another great reason to have her around is while Matt goes on trips. She's pretty big and has an extremely aggressive bark. Well weeks ago Matt was on a 3 week trip, my dog never, ever barks unless she's trying to alert me of something. It was about 1am on a Saturday and she woke me up barking like crazy, I seriously was thinking the raccoons got in the backyard again and were taunting her, so flipped on the lights outside and saw nothing, Greta barked another 2 times, and I was so frustrated, because getting out of bed when you're pregnant is a task. The last time she started barking, I got up and didn't flip on the lights. This is when I saw the flashlights in front of my house, the barking continued while I was standing right at our glass door. So naturally I called the police. 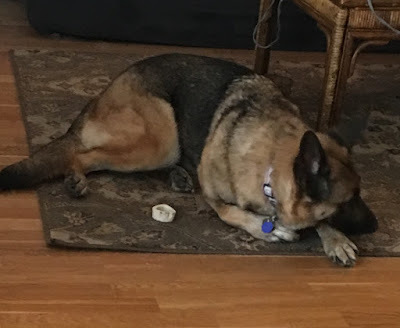 Who ever was poking around in my front yard didn't last long, when they heard the fury of a German Shepherd's bark (she is super protective). LAPD didn't show up at my house right away (big surprise), but I knew I was safe because of our girl. Not to worry, I am ok, and my car was NOT broken into. After this instance, I really started thinking about our safety in the house with a little one on the way. I was scared, I was alone and realized I didn't have a plan, even though I live in a pretty safe area. I will tell my neighbors when my husband is gone for extended period of time, there is such thing as protection in numbers. We have a camera system set up, to see what goes on outside. We have Greta..my favorite part. We will not be leaving windows open at night, including the dog door. Still trying to figure out the California laws for concealed firearms. Yes, i'm still a Texan. Sleeping with my car keys to make sure I can press my panic button if I feel i'm in danger. Looking in the process of getting an alarm system! After this unfortunate event, I started a post in our neighborhood forum and figured out that staying connected with the rest of our neighborhood was our best bet. The very next day after my post, a house had got broken into through the dog door. So there were definitely predators in our neck of the woods. I connected with SimpliSafe for tips about safety! I was so fortunate to do so, because nobody really thinks about home invasions, but they still happen, and everyone should have a plan and be ready. Week 26: This week i've hit an all time low.